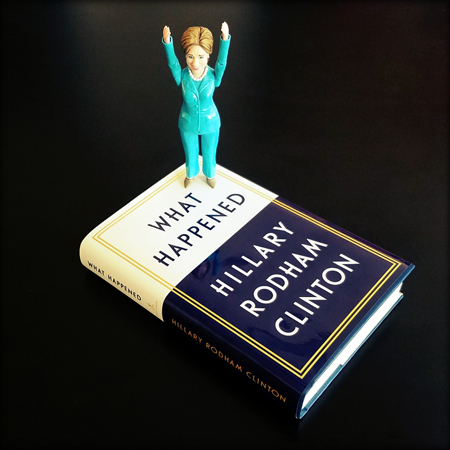 This is the fourteenth installment of the What Happened Book Club, where we are doing a chapter a week. So! Let us continue our discussion with Chapter Fourteen: Trolls, Bots, Fake News, and Real Russians. Woo, this chapter. Goddammit. There is a lot to deal with in this very technical chapter, reflecting on Russian interference in the election, but I'm going to start with my favorite quote of the whole thing, and one of my favorite quotes of the book, from the section on Vladimir Putin's grudge against Hillary Clinton: "Our relationship has been sour for a long time. Putin doesn't respect women and despises anyone who stands up to him, so I'm a double problem." And that's all the laughter we're gonna get from this one, folks. Because, although Clinton gets deep in the weeds in the chapter, in her typically meticulous style, the real story here is one of a Cassandra, who keeps raising flags that the men who run this country choose to ignore. In 2016 our democracy was assaulted by a foreign adversary determined to mislead out people, enflame our divisions, and throw an election to its perfect candidate. That attack succeeded because our immune system had been slowly eroded over years. Many Americans had lost faith in the institutions that previous generations relied on for objective information, including government, academia, and the press, leaving them vulnerable to a sophisticated misinformation campaign. There are many reasons why this happened, but one is that a small group of right-wing billionaires — people like the Mercer family and Charles and David Koch — recognized long ago that, as Stephen Colbert once joked, "reality has a well-known liberal bias." More generally, the right spent a lot of time and money building an alternative reality. Think of a partisan petri dish where science is denied, lies masquerade as truth, and paranoia flourishes. Their efforts were amplified in 2016 by a presidential candidate who trafficked in dark conspiracy theories drawn from the pages of supermarket tabloids and the far reaches of the internet, a candidate who deflected any criticism by attacking others with made-up facts and an uncanny gift for humiliating zingers. He helped to further blur news and entertainment, reality TV and reality. It's tough to bear thinking about how the person who wrote this accurate postmortem on how we got here is the same person who was widely mocked in 1998, two decades ago, for correctly noting the existence of a "vast right-wing conspiracy." In a series of memos, I warned President Obama that things were changing in Russia, and America would have to take a harder line with Putin. Our relationship was likely to get worse before it got better, I told the President, and we needed to make it clear to Putin that aggressive actions would have consequences. In the wake of Russia's Ukraine operations, I expressed my concerns to some of my former national security colleagues. Moscow had clearly developed new capabilities in psychological and information warfare and was willing to use them. I was worried the United States and our allies weren't prepared to keep up or respond. And she was preparing to tackle this challenge head-on as president, had the very scenario about which she was warning hadn't preempted her presidency. I wanted to go further than the Obama administration, which resisted providing defensive arms to the Ukrainian government or establishing a no-fly zone in Syria, where Putin had launched a military intervention to prop up the murderous dictator Bashar al-Assad. I also intended to increase our investment in cybersecurity and pursue an all-hands-on-deck effort to secure cooperation between the government and the private sector on protecting vital national and commercial infrastructure from attacks, including nuclear power plants, electrical grids, dams, and the financial system. All of this is to say that I had my eyes open. I knew Putin was a growing threat. Hillary Clinton had Putin's number, perhaps more than anyone else in the United States. She was best prepared and eminently willing to face him down, without hesitation. No wonder he did everything he could to stop her.